Welcome to the SCA Scores Site! You have arrived at the most comprehensive site for marshaled scores across the Society for Creative Anachronism! You may be here to look at your own scores, those of a friend, or even a rival's! Feel free to look around your Kingdom and others! If you are a marshal and would like to be able to submit scores here, contact your Kingdom's representative to acquire an account. 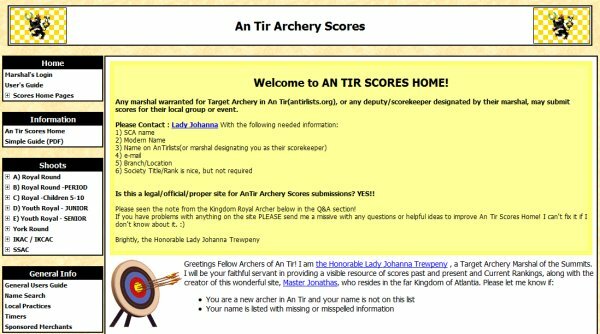 If your Kingdom is not listed, contact Sir Jonathas - creator of the SCA Scores Site, and your Kingdom's Activity Earl Marshal with your request to begin your adventure in this community of online scorekeeping! On arrival you will find a column on the left of your screen which gives you options. Go to your Kingdom, search for a Name or Local Practice, see the results of Seasonal and Inter-Kingdom Challenges or check out merchants sponsored by marshals. 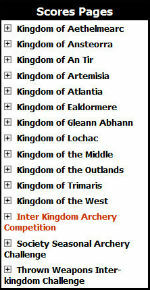 For return visits you can bookmark a direct link using the "Easy Address" noted on your Kingdom's home page. 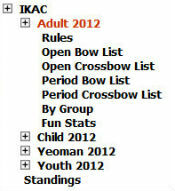 You are now on the IKAC page of the Scores Site. Navigate back from any page using 'Scores Home Pages' or continue to your selected shoot. This example is the Adult. Select the + to see options. Now you can select which results to view. Marshals logged into their accounts can submit scores here. 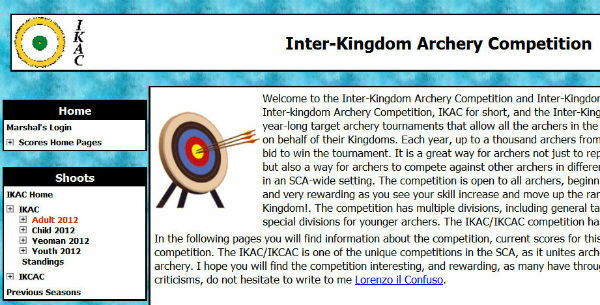 In the IKAC Open Bow list there are currently 283 archers participating and a few scores still waiting to join the list. By clicking on the number beside the name, you can see all of the scores for the person. Past years can also be seen. Go back to the 'Shoots' menu, select Previous Seasons. Enter a KINGDOM.... to see scores for each Kingdom you follow a similar path. From this site ANYONE can peruse scores posted by marshals of each Kingdom. Individual Kingdoms may differ slightly in specifics - this example uses AnTir's page. 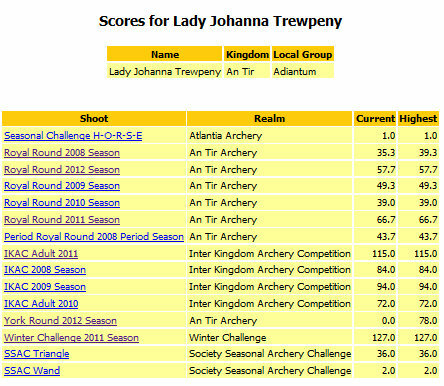 The Name Search option in the left column takes you here and into the details of one archer's experience displayed on the Scores Site. Search for yourself or friends! Thank you for stopping by! Come again and bring your friends! 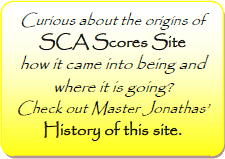 Please send you questions and ideas to Sir Jonathas to enhance the usefulness of the SCA Scores Site!